The mission: Air-drop critical supplies of food and water to Iraqi citizens displaced from their homes by Islamic State militants. Aircrews from the 816th Expeditionary Airlift Squadron fulfilled that mission — and then some, according to a report from Staff Sgt. Shawn Nickel, Air Forces Central Command Public Affairs. Master Sgt. Stephen Brown, for one, taped a package of Skittles to a bundle of Halal Meals Ready to Eat, which was delivered in an August airdrop to displaced Iraqis in the vicinity of Sinjar Mountain. Overall, two C-17 Globemaster IIIs and two C-130 Hercules dropped 10,545 gallons of water and 7,056 Halal Meals Ready to Eat in 109 bundles, and almost every one dropped with a little extra. Reminiscent of retired Col. Gail Halvorsen, the original Candy Bomber of World War II? 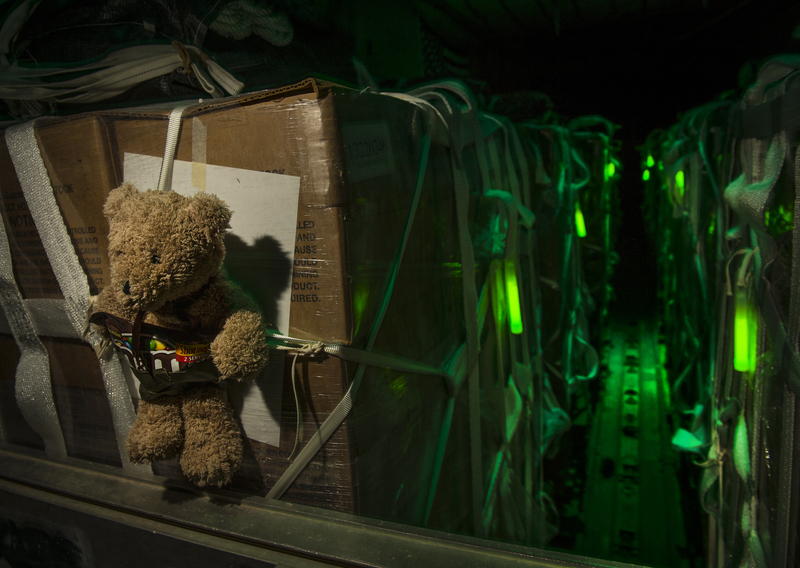 For the drops, airmen contributed items they had received in care packages or bought themselves or had been given specifically for the Iraqis. By the end of August, crews had graduated from dropping single packs of candy to garbage bags full of donated sweets. This cheered my whole week So pleased that the little extra is being done. George Washington’s troops did the same thing for kids in the towns they marched through. Just didn’t need a parachute! No Hershey’s or Babe Ruth then. I am grateful to you all. Children are the hope of the world! Gratitude from the Berlin Candy Bomber, Spirit of Freedom Co-pilot and still do it on occasion!